Amruta Kulkarni a practicing Nutritionist from Thane with fifteen years experience is actively involved in creating new diet programs & contributing to health and wellbeing of individuals. She has been in a constant pursuit to look for ways and means to create awareness about food habits & active lifestyle. Her more than a decades experience in this field has involved consulting services to various Health Clubs, one to one consultation, speaking at events, live program on IBN-LOKMAT, writing an article for a popular publication, she has been a Judge in various Healthy Recipe Competitions. 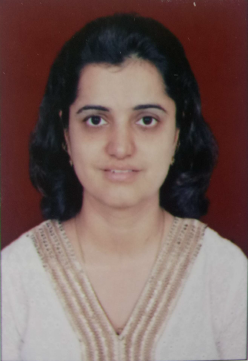 Amruta is a B.Sc. Graduate (Foods, Nutrition& Dietetics) from Nirmala Niketan, College of Home science. She has also successfully completed a one year Diploma in Naturopathy and a Post Graduate Program in Sports Nutrition from Hyderabad Sports Medicine, Educational & Research Foundation. Currently, Amruta is working as a Consulting Nutritionist with Corporates. She organizes Seminars on HEALTH FOODS. To provide dietary solution to people for different physical conditions. Create & Increase widespread awareness about benefits of healthy eating. To give result oriented dietary advice. To motivate and help clients develop an awareness of healthy eating. Stress on developing effective dietary habits rather than short term solutions. Regular intake of Healthy & Nutritious food is a good preventive measure to keep away many illnesses. Good nutrition and what you put into your body is the foundation for good health. “Food is Medicine” is a term which was originally coined by Hippocrates, the father of Western medicine; Hippocrates believed that illness stemmed from inadequate nutrition and bad eating habits and that if people were to learn good eating habits then optimum health would be restored. Being healthy means consuming the right food in desired quantity. Every meal you consume influences the way that you feel one way or another so the more nutritious foods you choose, the healthier you will be. Whole foods act as medicine to heal and protect your body & give the immune system a break from dealing with toxins, preservatives, additives and chemicals that are included in so many of today’s processed foods. Healthy, nutrient rich foods help to heal the body at cellular level and build strong defences enabling you to combat illness and environmental toxins. Therefore to achieve optimum health it is important to make the necessary dietary changes. DIET COUNSELLING is a motivating factor that can help a person to change his/her attitude towards food. ”. A diet counsellor will help an individual assess his/ her current eating habits and identify areas where change is needed and also educate on the health effects of different dietary choices. . Working together with the counsellor an individual can identify areas where change is needed and prioritize the changes. Looking at the current scenario where lifestyle diseases (obesity, diabetes and hypertension) are such a common occurrence, effective diet counselling will play a major role in bringing about positive dietary changes in an individual as it will reinforce, support and encourage and be guiding force that will help individuals achieve health goals. Nourish your body with good food and watch it works wonders on your health. Your taste buds will adapt in couple of weeks and you will begin to feel the difference. All you have to do is to make a beginning…………. © Nutriplatter. All Rights Reserved.